“Passion Flower” redirects here. For other uses, see Passion Flower (disambiguation). Banana passion flower or “banana poka” (P. tarminiana), originally from Central Brazil, is an invasive weed, especially on the islands of Hawaii. It is commonly spread by feral pigs eating the fruits. It overgrows and smothers stands of endemic vegetation, mainly on roadsides. Blue passion flower (P. caerulea) is holding its own in Spain these days, and it probably needs to be watched so that unwanted spreading can be curtailed. Notable and sometimes economically significant pathogens of Passiflora are several sac fungi of the genus Septoria (including S. passiflorae), the undescribed proteobacterium called “Pseudomonas tomato” (pv. passiflorae), the Potyvirus passionfruit woodiness virus, and the Carlavirus Passiflora latent virus. The French name for this plant has lent itself to La Famille Passiflore, a highly successful children’s book series by Geneviève Huriet, and an animated series based upon it. These have been translated into English as Beechwood Bunny Tales and The Bellflower Bunnies. Sweet granadilla (P. ligularis) is another widely grown species. In large parts of Africa and Australia it is the plant called “passionfruit”: confusingly, in South African English the latter species is more often called “granadilla” (without an adjective). Its fruit is somewhat intermediate between the two sold as P. edulis. Maypop (P. incarnata), a common species in the southeastern US. This is a subtropical representative of this mostly tropical family. However, unlike the more tropical cousins, this particular species is hardy enough to withstand the cold down to −20 °C (−4 °F) before its roots die (it is native as far north as Pennsylvania and has been cultivated as far north as Boston and Chicago.) The fruit is sweet, yellowish, and roughly the size of a chicken’s egg; it enjoys some popularity as a native plant with edible fruit and few pests. Passionflower is classified as generally recognized as safe (GRAS) for use in foods in the US, and is “possibly safe when used orally and appropriately for short-term medicinal purposes,” “possibly unsafe when used in excessive amounts,” but unsafe when used orally during pregnancy since “…passionflower constituents show evidence of uterine stimulation.” The database suggests it is possibly effective for adjustment disorder with anxious mood, anxiety, and opiate withdrawal, but it “can cause dizziness, confusion, sedation, and ataxia” and there are some reports of more severe side effects including vasculitis and altered consciousness. The genus is rich in organic acids including formic, butyric, linoleic, linolenic, malic, myristic, oleic and palmitic acids as well as phenolic compounds, and the amino acid α-alanine. Esters like ethyl butyrate, ethyl caproate, n–hexyl butyrate and n–hexyl caproate give the fruits their flavor and appetizing smell. Sugars, contained mainly in the fruit, are most significantly d-fructose, d-glucose and raffinose. Among enzymes, Passiflora was found to be rich in catalase, pectin methylesterase and phenolase. In addition, the flower keeps open three days, symbolising the three years’ ministry. The flower has been given names related to this symbolism throughout Europe since that time. In Spain, it is known as espina de Cristo (“thorn of Christ'”). 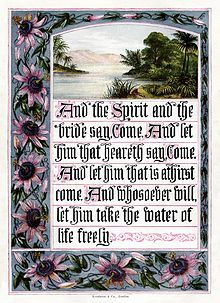 Older Germanic names include Christus-Krone (“Christ’s crown”), Christus-Strauss (“Christ’s bouquet”), Dorn-Krone (“crown of thorns”), Jesus-Lijden (“Jesus’ passion”), Marter (“passion”) or Muttergottes-Stern (“Mother of God’s star”). Outside the Roman Catholic heartland, the regularly shaped flowers have reminded people of the face of a clock. In Israel they are known as “clock-flower” (שעונית) and in Greece as “clock plant” (ρολογιά); in Japan too, they are known as tokeisō (時計草, “clock plant”). In Hawaiian, they are called lilikoʻi; lī is a string used for tying fabric together, such as a shoelace, and liko means “to spring forth leaves”. In India, blue passionflowers are called Krishnakamala in Karnataka and Maharashtra, while in Uttar Pradesh and generally north it is colloquially called “Panch Pandav” (referring to the five Pandavas in the Hindu epic, the Mahabharata). The five anthers are interpreted as the five Pandavas, the divine Krishna is at the centre, and the radial filaments are opposing hundred. The colour blue is moreover associated with Krishna as the colour of his aura. Relationships below the subgenus level are not known with certainty and are an active area of research. The Old World species form two clades – supersection Disemma (part of subgenus Decaloba) and subgenus Tetrapathaea. The former is composed of 21 species divided into sections Disemma (3 Australian species), Holrungiella (1 New Guinean species) and Octandranthus (17 south and east Asian species). ^ Krosnick, S.E. ; Porter-Utley, K.E. ; MacDougal, J.M. ; Jørgensen, P.M.; McDade, L.A. (2013). “New insights into the evolution of Passiflora subgenus Decaloba (Passifloraceae): phylogenetic relationships and morphological synapomorphies”. Systematic Botany. 38 (3): 692–713. doi:10.1600/036364413×670359. ^ Abrahamczyk, S. (2014). “Escape from extreme specialization: passionflowers, bats and the sword-billed hummingbird”. Proceedings of the Royal Society B. 281 (1795): 20140888. doi:10.1098/rspb.2014.0888. PMC 4213610. PMID 25274372. ^ de Castro, É.C.P. ; Zagrobelny, M.; Cardoso, M.Z. ; Bak, S. (2017). “The arms race between heliconiine butterflies and Passiflora plants – new insights on an ancient subject”. Biological Reviews. 93 (1): 555–573. doi:10.1111/brv.12357. PMID 28901723. ^ Ehrlich, P.R. ; Raven, P.H. (1964). “Butterflies and Plants: A Study in Coevolution”. Evolution. 18 (4): 586–608. doi:10.2307/2406212. JSTOR 2406212. ^ Benson, W.W; Brown, K.S. ; Gilbert, L.E. (1975). “Coevolution of plants and herbivores: passion flower butterflies”. Evolution. 29 (4): 659–680. doi:10.2307/2407076. JSTOR 2407076. PMID 28563089. ^ Merrill, R.M. ; Naisbit, R.E. ; Mallet, J.; Jiggins, C.D. (2013). “Ecological and genetic factors influencing the transition between host-use strategies in sympatric Heliconius butterflies” (PDF). Journal of Evolutionary Biology. 26 (9): 1959–1967. doi:10.1111/jeb.12194. PMID 23961921. ^ Knight, R.J.; Payne, J.A. ; Schnell, R.J.; Amis, A.A. (1995). “‘Byron Beauty’, An Ornamental Passion Vine for the Temperate Zone” (PDF). HortScience. 30 (5): 1112. ^ Neck, Raymond W. (1976). “Lepidopteran Foodplant Records from Texas” (PDF). Journal of Research on the Lepidoptera. 15 (2): 75–82. Retrieved 25 October 2017. ^ Chitwood, D.; Otoni, W. (2017). “Divergent leaf shapes among Passiflora species arise from a shared juvenile morphology”. Plant Direct. 1 (5): e00028. doi:10.1002/pld3.28. ^ “RHS Plant Selector Passiflora ‘Amethyst’ AGM / RHS Gardening”. Apps.rhs.org.uk. Retrieved 28 January 2013. 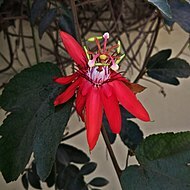 ^ “RHS Plant Selector Passiflora × exoniensis AGM / RHS Gardening”. Apps.rhs.org.uk. Retrieved 28 January 2013. ^ “RHS Plant Selector Passiflora × violacea AGM / RHS Gardening”. Apps.rhs.org.uk. Retrieved 28 January 2013. ^ Smith, Clifford W. “Impact of Alien Plants on Hawai’i’s Native Biota”. University of Hawaii. Archived from the original on 13 July 2011. Retrieved 8 March 2011. ^ The University of Georgia – Center for Invasive Species and Ecosystem Health and the National Park Service (17 February 2011). “Invasive Plant Atlas of the United States”. Retrieved 8 March 2011. ^ Akhondzadeh, S. (October 2001). “Passionflower in the treatment of generalized anxiety: a pilot double-blind randomized controlled trial with oxazepam”. Journal of Clinical Pharmacy and Therapeutics. 26 (5): 363–367. doi:10.1046/j.1365-2710.2001.00367.x. ^ Boeira, JM; Fenner, R; Betti, AH; et al. (March 2010). “Toxicity and genotoxicity evaluation of Passiflora alata Curtis (Passifloraceae)”. J Ethnopharmacol. 128 (2): 526–32. doi:10.1016/j.jep.2009.09.037. PMID 19799991. ^ Saliminia, Alireza; Azimaraghi, Omid (12 June 2017). “Preoperative Oral Passiflora Incarnata Reduces Coughing Following Extubation: A Double Blind, Placebo-Controlled Study”. Archives of Anesthesiology and Critical Care. 3 (3): 338–341. ISSN 2423-5849. 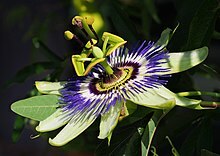 ^ “Passionflower”. University of Maryland Medical Center. ^ “CFR – Code of Federal Regulations Title 21”. fda.gov. ^ Kostka, Arun Oswin. “Flowers in Christian Symbolism”. ^ Mary Kawena Pukui and Samuel Hoyt Elbert (2003). “lookup of lilikoʻi“. in Hawaiian Dictionary. Ulukau, the Hawaiian Electronic Library, University of Hawaii Press. Retrieved 2 November 2014. ^ Feuillet, C.; MacDougal, J. (2004). “A new infrageneric classification of Passiflora L. (Passifloraceae)”. Passiflora. 13 (2): 34–35, 37–38. ^ Krosnick, S.E. ; Ford, A.J. ; Freudenstein, J.V. (2009). “Taxonomic Revision of Passiflora Subgenus Tetrapathea Including the Monotypic Genera Hollrungia and Tetrapathea (Passifloraceae), and a New Species of Passiflora”. Systematic Botany. 34 (2): 375–385. doi:10.1600/036364409788606343. ^ Hansen, K.A. ; Gilbert, L.E. ; Simpson, B.B. ; Downie, S.R. ; Cervi, A.C.; Jansen, R.K. (2006). “Phylogenetic Relationships and Chromosome Number Evolution in Passiflora”. Systematic Botany. 31 (1): 138–150. doi:10.1600/036364406775971769. ^ “MBG: Research: Passiflora Research Network”. mobot.org. Akhondzadeh, Shahin; Naghavi, H.R. ; Vazirian, M.; Shayeganpour, A.; Rashidi, H.; Khani, M. (2001). “Passionflower in the treatment of generalized anxiety: a pilot double-blind randomized controlled trial with oxazepam” (PDF). Journal of Clinical Pharmacy and Therapeutics. 26 (5): 363–367. doi:10.1046/j.1365-2710.2001.00367.x. Archived from the original (PDF) on 26 March 2009. Retrieved 6 September 2008. Dhawan, Kamaldeep; Kumar, Suresh; Sharma, Anupam (2002). “Beneficial Effects of Chrysin and Benzoflavone on Virility in 2-Year-Old Male Rats”. Journal of Medicinal Food. 5 (1): 43–48. doi:10.1089/109662002753723214. PMID 12511112. Duke, James A. : Dr. Duke’s Phytochemical and Ethnobotanical Databases – Passiflora spp. Retrieved 2008-NOV-01. Hansen, A. Katie; Escobar, Linda K.; Gilbert, Lawrence E.; Jansen, Robert K. (2006). “Paternal, maternal, and biparental inheritance of the chloroplast genome in Passiflora (Passifloraceae): implications for phylogenic studies” (PDF). American Journal of Botany. 94 (1): 42–46. doi:10.3732/ajb.94.1.42. PMID 21642206. Marzell, Heinrich (1927): Deutsches Wörterbuch der Pflanzennamen [“German Plant Name Dictionary”]. Leipzig. Petersen, Elly (1966): Passionsblume [“Passion flowers”]. In: Praktisches Gartenlexikon der Büchergilde (2nd ed. ): 270-271 [in German]. Büchergilde Gutenberg. Frankfurt am Main, Vienna, Zürich. Radhamani, T.R. ; Sudarshana, L.; Krishnan, R. (1995). “Defence and carnivory: dual roles of bracts”. Passiflora Foetida. Journal of Biosciences. 20 (5): 657–664. doi:10.1007/BF02703305.